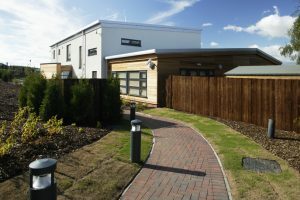 This project, for a private client adjacent to the new hospital in Hexham, can accommodate up to 110 pre-school children in a stimulating environment that allows them to learn and play. 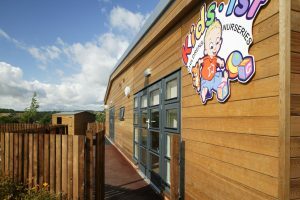 The building is off timber frame construction, clad in western red cedar and white render, with large expanses of north facing glazing to maximise the views over the northumbrian countryside and the carefully landscaped nursery garden. 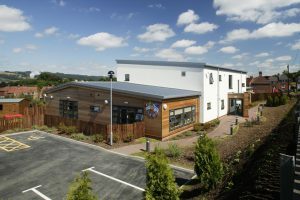 The ground floor includes activity spaces, sleep spaces, sensory rooms and changing facilities, whilst upstairs there are pre and after school facilities, a multi purpose room, soft play, staff room, laundry facilities and parents room, from where they can view their children below. 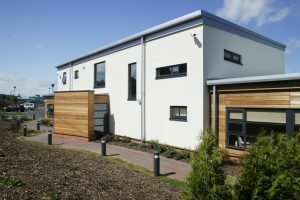 The building is highly insulated and uses recyclable materials throughout.